My mother and I were out doing a day of shopping when I visited home a couple weeks ago. We had some time to kill before going over to my aunts house for dinner, and we both hadn't had lunch, so we looked for somewhere to have a coffee. 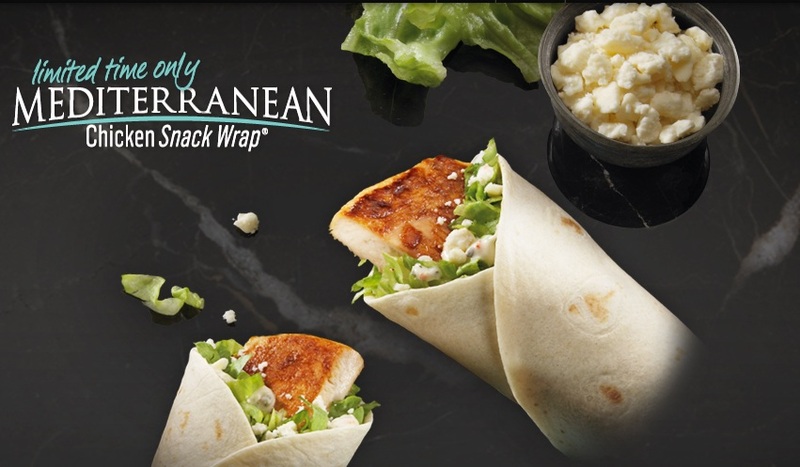 As we drove by the Walker Road McDonald's I saw a promotional poster for the Mediterranean Snack Wrap which hadn't been there the day before. 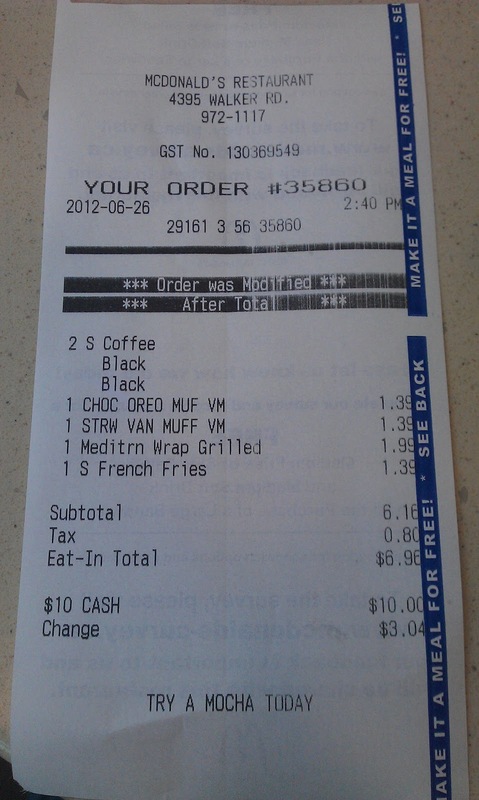 I still think the $1.39 coffee & muffin combo is the best deal around, so we decided to have a coffee there. When we entered there was a poster board next to the menu promoting the new snack wrap as well. 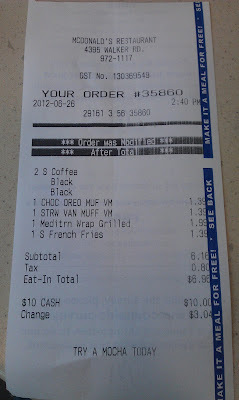 We ordered our coffee and muffins and I asked for 1 snack wrap (As I said before when I tried the Chipotle Snack Wrap with my mother back in January), in Canada they usually promote the snack wraps as 2 for $3.98, but if you ask for one, you can buy it for just $1.99), though since January they have changed the pricing for the pies, 2 are still $1.39, but one is now $0.99. When I ordered the wrap the woman taking my order said they were not available yet. When I pointed to the large sign behind her, she looked like she saw a ghost and asked her manager. The manager said they just started that day and were indeed available. I'm glad we had the option to get it grilled (unlike when we ordered the Chipotle one in Jan). Though it was small, my mother and I split it, and both of us actually really enjoyed it. It was nice to see that McDonald's used real feta cheese, and though on the marketing posters they call it topped with a 'Mediterranean herb sauce' its actually tzatziki sauce. Far from authentic, but identical to tzatziki sauces you buy in a bottle at a Canadian grocery store. 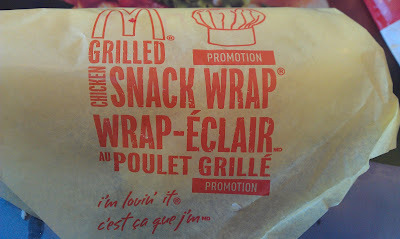 Naturally, both of us thought the wrap would benefit from being more garlicky, but it's understandable that McDonald's has a large market to cover and heavy amounts of garlic might be off-putting to many. My mother, who probably hadn't been to a McDonald's since we were together in January, said the same thing she did last time, 'Why don't they offer wheat pitas? 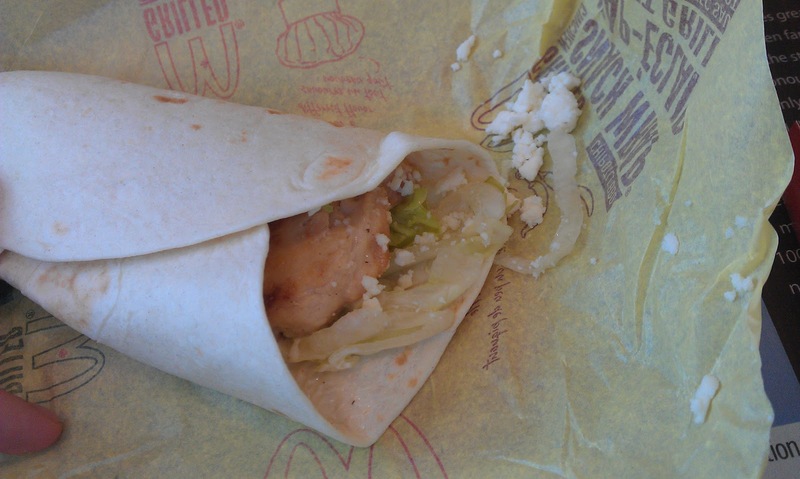 ', but unlike the Chipotle wrap she actually enjoyed it, we even brought it up at dinner with my aunt, that she was impressed that McDonald's used real feta and tzatziki. Though the biggest problem, much like the last time, was the size, and the amount of chicken you received inside the wrap. As good as the flavour was, it was let down by the minuscule amount of actual chicken inside the wrap. My mother, who is not a big eater whatsoever, even felt that she would need at least 2 wraps to feel remotely full. Myself, being a big eater, I could probably eat 4-5 without blinking, so even if you did get 2 for $3.98, you would still need to order a lot more to feel satisfied. If you aren't eating these just as a side dish, you might be better off getting something from the proper combo for only $1-2 more (and at least you get fries and a drink that way). I also don't think I have had a wrap in any Mediterranean country that hasn't had tomato or onion inside. 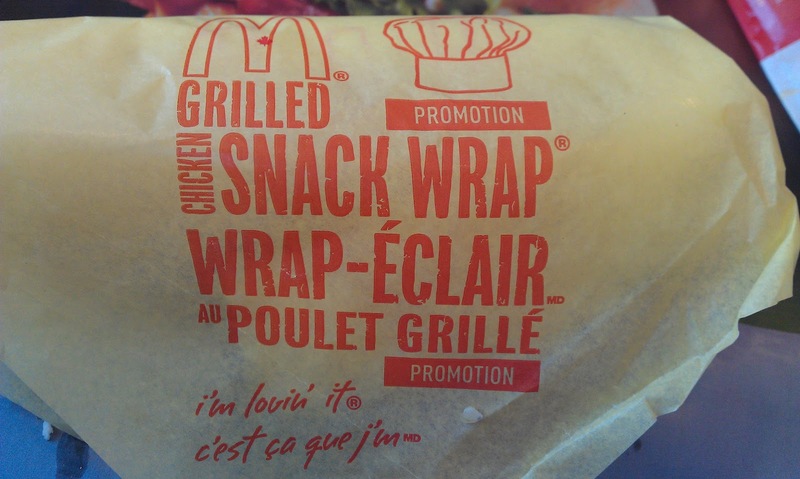 This wrap already using 'premium' ingredients that you don't usually see at McDonald's, so I don't know why they didn't make it properly and add a couple more pieces of veg.